When most people think of social networks they think of Facebook and Twitter, but social network analysis has its roots in psychology, sociology, anthropology and math (see Scott, John Social Network Analysis for more details). The phrase has a number of different definitions, depending on the discipline you’re interested in, but for the purposes of this discussion social network analysis can be used to understand the patterns of how individuals interact. For other definitions, look here. 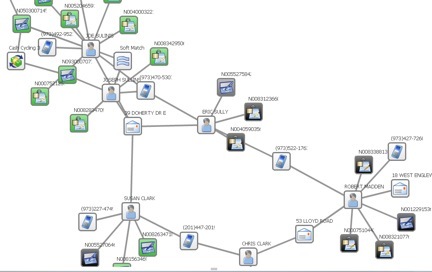 I had a very interesting conversation with the folks from SAS last week about Social Network Analysis. SAS has a sophisticated social network analysis solution that draws upon its analytics arsenal to solve some very important problems. These include discovering banking or insurance fraud rings, identifying tax evasion, social services fraud, and health care fraud (to name a few) These are huge issues. For example, the 2009 ABA Deposit Account Fraud Survey found that eight out of ten banks reported having check fraud losses in 2008. A new report by the National Insurance Crime Bureau (NICB) shows an increase in claims related to “opportunistic fraud,” possibly due to the economic downturn. These include worker’s compensation, staged and caused accidents. Sue Clark and Eric Sully also share an address with Joseph Sullins who has open accounts and who is soft matched to Joe Sullins who has many open accounts and has been doing a lot of cash cycling between them. This is depicted in the ring of fraud that the SAS software found, which is shown above. The dark accounts indicate accounts that have been closed. Joe Sullins represents a new burst of accounts that should be investigated. The SAS solution accepts input from many sources (including text, where it can use text mining to extract information from, say a claim). The strength of the solution is in its ability to take data from many sources and in the depth of its analytical capability. Many companies set up Investigation Units to investigate potential fraud. However, often times there are large numbers of false positives (i.e. investigations that show up as potential fraud but aren’t) which cost the company a lot of to investigate. Just think about how many times you’ve been called by your credit card company when you’ve made a big purchase or traveled out of the country and forgot to call them and you understand the dollars wasted on false positives. This cost, of course, pales in comparison to the billions of dollars lost each year to fraud. Social network analysis, especially using more sophisticated analytics, can be used to find previously undetected fraud rings. Of course, social network analysis has other use cases as well as fraud detection. SAS uses Social Network Analysis as part of its Fraud Framework, but it is expanding its vision to include customer churn and viral marketing (i.e. to understand how customers are related to each other). Other use cases include terrorism and crime prevention, company organizational analysis, as well as various kinds of marketing applications such as finding key opinion leaders. Social network analysis for marketing is an area I expect to see more action in the near term, although people will need to be educated about social networks, the difference between social network analysis and social media analysis (as well as where they overlap) and the value of the use cases. There seems to be some confusion in the market, but that is the subject of another blog. I agree that SNA in customer bases will become more important, especially in connection with fraud and risk management. Here in Germany we have very strict privacy laws, so I think SNA for marketing purposes will be difficult to implement.